Deep inside the Tennengebirge mountains lies a frozen world. The Eisriesenwelt ice caves at Werfen near the Austrian city of Salzburg are said to be the largest in the world. Warmer temperatures in the Alps have been causing concern about the future of glaciers and of the ski industry in the region. 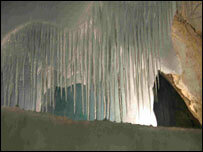 But the ice in the Eisriesenwelt ("World of the Ice Giants") has actually grown by a third since the 1920s. And there has been a marked increase in the growth of ice over the past 15 to 20 years. The mild winter this year did not damage the caves' frozen sculptures. In fact the warmer temperatures on top of the mountains may be helping the formations to develop earlier than usual. The ice is formed by water seeping through crevices into the freezing caverns below. The sooner the snow melts, the earlier water starts dripping into the caves. One of the first ice structures you see after entering the cave did not exist 10 years ago. The huge pillar was formed by tiny drops of melted snow water trickling through fissures in the rock. Even in the height of summer, temperatures in the caves usually stay below freezing - something that surprises many visitors. "I was thinking maybe in summer that it would get a bit warmer in the cave so that the ice might melt so it was actually surprising to hear that it was still building up," one woman visiting from the Netherlands said. Her companion agreed. "The ice keeps on growing and that's surprising," he said. "You start to wonder actually what happens when the ice seems to grow so fast and so far that you can't actually enter the cave any more. So it is really interesting. " There are thousands of caves in the Alps - but only a handful of them are filled with ice. Ice caves require special conditions, with at least two different openings at different levels. Most of them are found at a height between 1,300 and 2,000 metres (4,290-6,600 ft) above sea level. So far it seems that warmer temperatures outside have been beneficial for the ice caves. 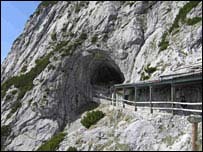 But that could change over time, according to Alois Rettenbacher, a cave guide at the Eisriesenwelt. "If the climate gets warmer, it could be an advantage in the short term," he said. "The question is how much warmer it will get. If the temperature increases by five, six or seven degrees, that could be a disadvantage - because the base temperature inside the cave wouldn't then be cold enough for the formation of ice." In the heart of the ice cave, a row of icicles forms a sculpture known as Frigga's Veil, named after the ancient Norse goddess of the heavens. Whether it grows or shrinks, this delicate structure is likely to look very different in the years to come.